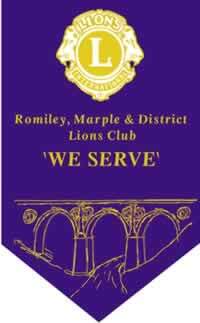 Young people from Belarus have been spending time in the UK thanks to a scheme supported by Romiley & Marple Lions Club. The Chernobyl Children's Project provides respite breaks for children suffering from ill health as a result of the 1986 Chernobyl nuclear disaster, and the ongoing effects of radiation in the area. The Lions supported a trip to the seaside to Llandudno - for many of the visiting children it was the first time they have seen the sea, as Belarus is landlocked. Members of the Lions Club gathered to see them off including bagpiper Lion George Tavener. Pictured above are members of Romiley and Marple Lions greeting the children from Belarus, their carers and host families..
Below picture - Lion George Tavener - our famous bagpiper was on hand to wave the party off on their day out.